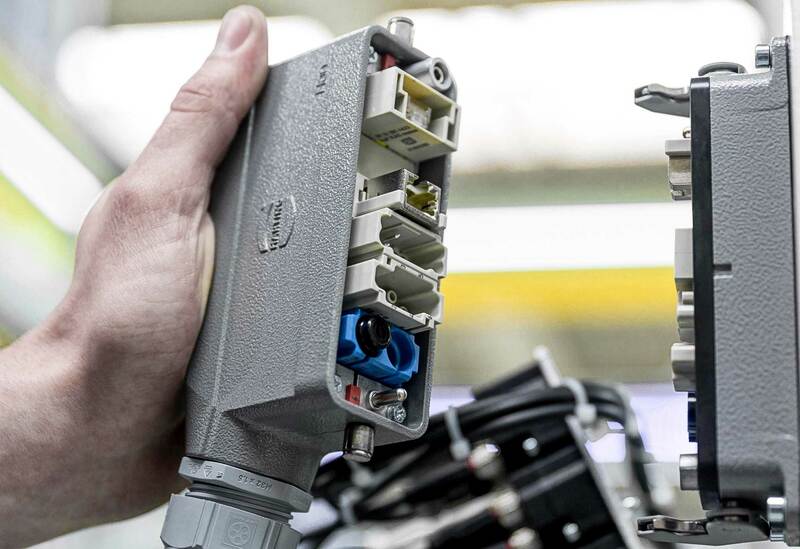 With the Han-Modular® series, you can optimally design connectors to supply machinery and equipment. With the Han-Modular® series, you can optimally design connectors to supply machinery and equipment. This is made possible by combining individual modules for different transmission media. Signals, data, power and compressed air - in standard-sized industrial connector housings. Han-Modular® offers easy-to-handle, highly flexible solutions with a small footprint and versatile functionality. THE modular connector: Merge power, signals, data, and even compressed air into a unique connector. Discover millions of different mating faces! HARTING has complemented the well-known Han-Modular® building block system with the addition of the new "hinged frame plus". Among others, the “plus” for the proven hinged frame comes in the form of an additional stainless steel spring that holds the frame together in the open and closed positions, as well as other details that have been optimised. Particular time and cost advantages result from the fact that assembling the connector modules is easier and more efficient. Industrial facilities increasingly feature modular designs. More and more mobile equipment is being used in manufacturing, and swap-outs are being done more frequently and as quickly as possible. This also means that more connectors are required which are designed for a high number of mating cycles. The HARTING Han-Modular® “High Mating Cycles” (HMC) hinged frame allows the integration of contacts designed for especially high mating cycles (10,000 insertions/removals) in inserts from the proven Han-Modular® series. Use of the Han-Modular® HMC hinged frame means Han-Modular® modules can be integrated into a HMC housing – and are consequently equipped for over 10,000 mating cycles. The HMC hinged frame differs from conventional hinged frames particularly with regard to the PE contact. The contact is specially coated in the HMC hinged frame and is attached to the latter using a special process. 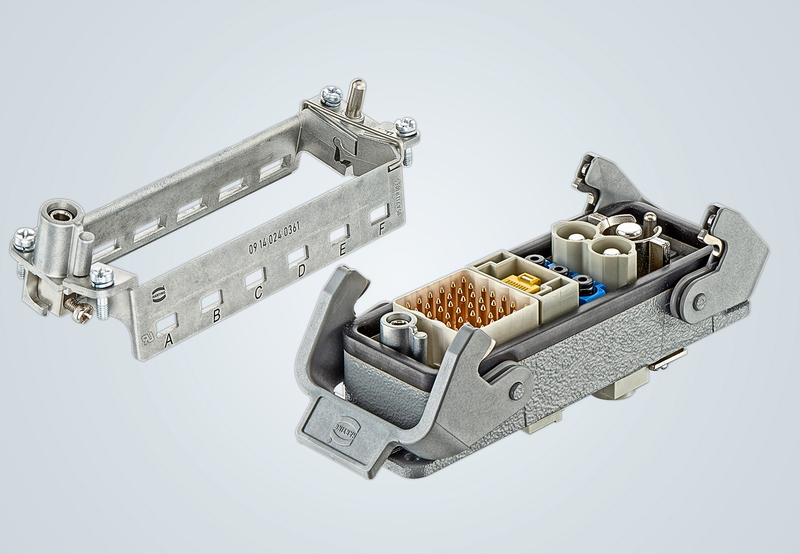 HARTING has extended the Han-Modular® series with the introduction of a module for the pluggable connection of large PE cross-sections (10-35 mm²). The hinged frame of the Han-Modular® series already features two integrated PE connections for the 0.5-10mm² cross-section range. Cross-sections of 10-35 mm² can now be realized using the new pluggable PE module. Special cables with reduced PE are no longer necessary. The PE module is simply mounted in the articulated frame, creating a secure, electrically conductive connection from the PE contact to the hinged frame and the housing. The PE protective earth connection is pre-leading and complies with standard IEC 61984. Networking and digitisation of manufacturing processes has meant an increase in the proportion of Ethernet components at the field level. To meet this trend, HARTING developed the Han-Modular® Switch US4. The US4 enables components such as high-resolution cameras used for quality assurance to be e.g. integrated into the network of a production facility with little effort. The Ethernet Switch US4 is suitable for industrial applications and supports Ethernet (10 Mbit/s), Fast Ethernet (100 Mbit/s) and Gigabit Ethernet (1000 Mbit/s). Up to 4 devices can be connected via RJ45 ports. The US4 Switch is Plug&Play compatible, and integrated LEDs provide quick and easy power and network diagnostics. HARTING’s strategy towards smarter connectors goes further: an ID module provides memory space for the connector. Other solutions emerging on the horizon are integrated sensors and wireless modules in the modular connector. 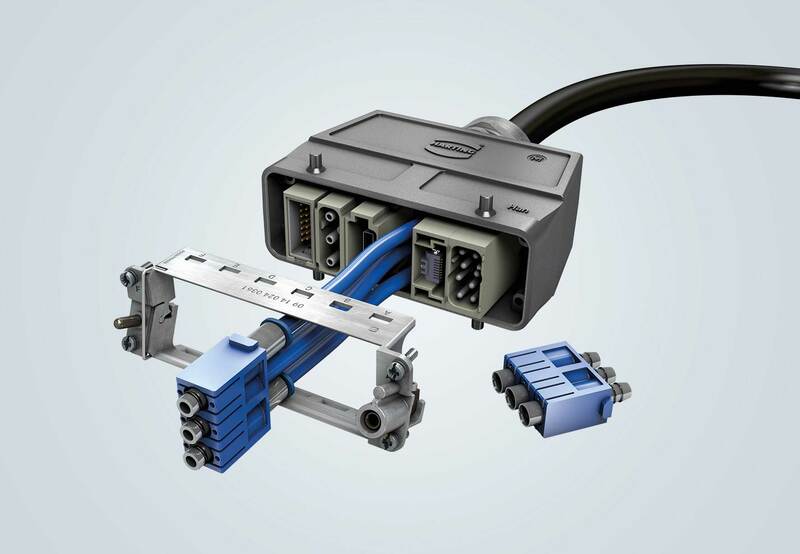 With the Han-Modular® Docking Frame, HARTING offers a floating connection solution. It combines the effective connection of signal and power and a very good isolation. HARTING significantly adds values to Sinowatt products. The Han® product family represents safety, realiability and user friendly design. I am from Beijing Sifang Automation Co., Ltd. Our company is a listed enterprise on Shanghai stock market. We are a leading company in power and industrial automation industries in China. I am a researcher from the R&D department of Sifang. Our company has been cooperating with HARTING for over ten years already. We use HARTING’s connectors most on our device. HARTING is very well known for the high quality products and good services. I sincerely hope HARTING to continue the success and prosperity. The new Han-Modular® Hinged Frame Plus delivers time savings up to 40%. Increase the efficiency of your assembly! 10.000 mating cycles due to contacts made of metal. Optimized flow rate for maximally efficiency.